Flat rate bee removal and control in Surprise. Guaranteed service for one flat fee. Honeycomb removal and repair service in Surprise. From start to finish we will take care of it all. We offer extermination services for all species of wasps, hornets, and other stinging insects in Surprise. Bee removal in Surprise, Arizona is all too common these days. With all the construction and growth comes wildlife and the bees are leading the way. All the swimming pools and flower gardens all over Surprise make it a comfortable place for bees to call home. The Most common problems being honey bees moving into the attic space or walls of homes and businesses. This leads to honeycomb in the walls and attics that will need to be removed properly to ensure they never return to the same area. 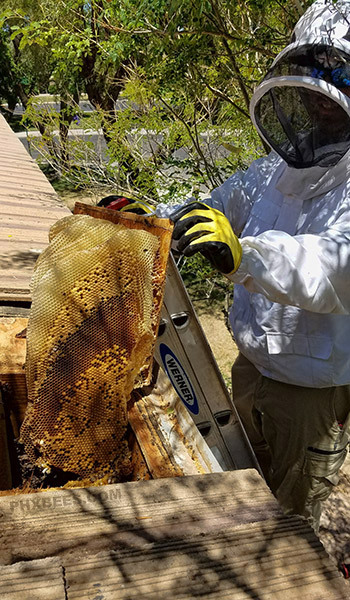 We provide hassle-free bee removal services as well as beehive and honeycomb removals and repair services for Surprise, AZ. We are well experienced and take pride in continuing to offer responsible, safe, and effective flat rate bee removal services all throughout Surprise and its neighboring cities. We are locally owned and owner operated that means no middle man and no inexperienced technicians creating a dangerous situation and possibly getting someone hurt. We handle everything from start to finish so you don't have to worry about any unexpected expenses or repairs. Having your bee problem handled by a professional is a very important step in keeping you and your neighbors safe from getting stung. 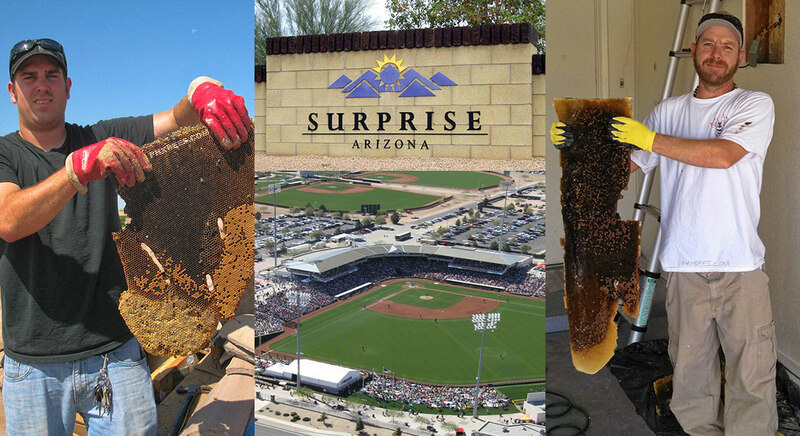 Surprise, Arizona is home to a large amount of the valley's Africanized Bee population. Our service calls have doubled over the past few years in Surprise and will continue to grow as more homes and shopping centers are built giving feral bees no choice but to move into populated areas. The more Surprise grows the more the chances for bee encounters increase and also bee attacks will become more prevalent. Once bees have become established inside a wall or in the roof of your home. They will start building honeycomb and once they get going they can build as much a pound of honeycomb a day depending on the size and health of the beehive. This honeycomb needs to be removed and the area needs to be sealed up properly to prevent any reoccurrence. What if I leave the honeycomb in the wall? It won't take long for the Arizona heat to melt the wax and send honey dripping all over the place. This will cause property damage and can also become a safety issue with potential fire hazards as honey comes into contact with live electrical wires. Also, mold can become a huge problem as the rotten honeycomb can become dangerous to breathe in. As long as there is honeycomb in the walls you will have a recurring bee problem for years to come. Give us a call to get a free quote on having honeycomb removed from your home and also have the area repaired. 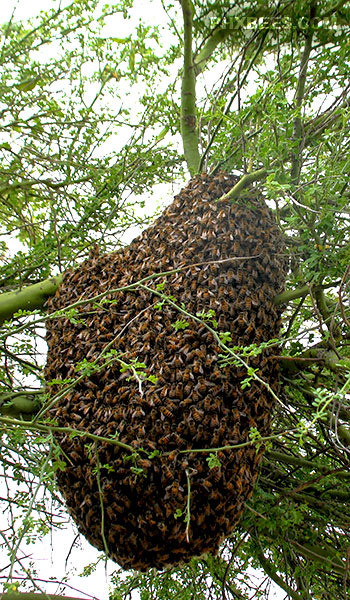 Honeybee swarms that land on trees and make a big ball of bees are often mistaken for active hives. These migrating bee swarms will normally move on within 72 hours and are not dangerous. The bees are in a very docile state when they are migrating and as long as they are left alone the will fly. Disturbing the bees or spraying them with water will only make the problem worse by splitting up the swarm and causing them to become confused and form several different swarms. This happens all too often and can be avoided by letting the bees take their natural course and migrate. We have handled hundreds of bee removals in Surprise over the years. Some of the biggest honeycomb removals we have done were in Surprise back when there were a lot of foreclosed homes all over the valley. 100lbs. plus beehives were being removed regularly all over the valley. Bees can be dangerous if the problem is not approached properly. Africanized bees can be extremely dangerous and even result in death if treated by someone inexperienced. Please call a professional to talk about your bee problem. Never try to treat the bees yourself always consult a professional. Flat Rate Bee Removal is Offred Mon-Fri during normal business hours.